This 35.5mm. 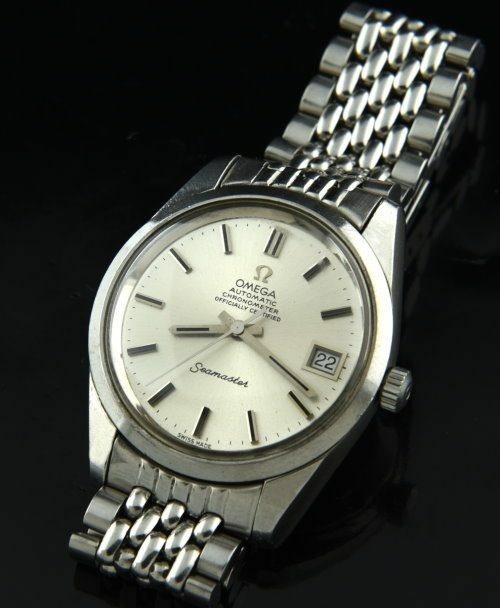 stainless steel OMEGA SEAMASTER chronometer is much less common than a CONSTELLATION. These watches were produced in small numbers and are becoming hard to find these days. This watch has an OMEGA CHRONOMETER grade automatic caliber 1010 movement which was just cleaned and accurately running. The OMEGA winding crown and hesalite OMEGA crystal are correct. The ORIGINAL silver dial is VERY clean and has great looking pencil style original hands and matching black inset steel baton markers. The clean beads of rice OMEGA bracelet is original and will fit up to a 7.2 inch wrist. These watches are very high quality and priced extremely well.